Does this sound familiar? After a heavy rain, a low spot in your lawn instantly turns into a mini pond and lasts for days, taking its toll on your grass and your shoes. Why not turn that spot into a garden filled with moisture-loving plants instead? Here are ten plants that will be happy to soak up all that excess rainfall for you. 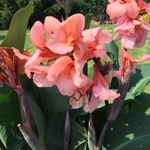 Click on the plant names to find more details on each variety listed below. This bold annual with a totally tropical feel thrives with lots of moisture and blooms like crazy from summer through fall. Bumble bees enjoy their showy blooms and songbirds will peck open the seed pods that form as the flowers become spent. Toucan varieties typically grow a bit shorter than full-sized cannas, topping out around four feet tall, but they may grow taller in your low, wet spot. Which Tut is right for you: six, three or one foot tall? 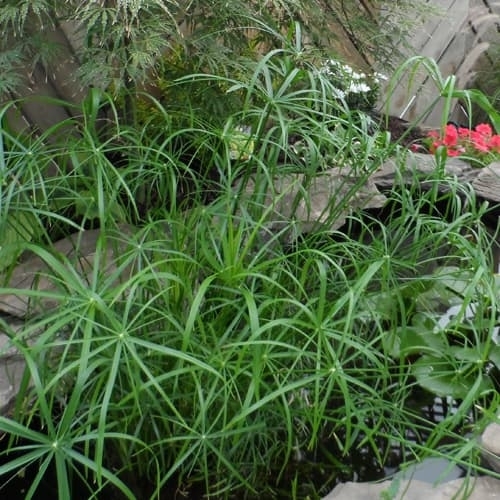 This entire family of papyrus grasses is eager to find a cozy, wet spot in your landscape, pond or a container lacking a drainage hole. Though they will grow in average soil, you really haven’t seen what these plants can do for you until you give them tons of water. Their plumes will be majestic no matter which Tut you choose, and they make long lasting cut flowers, too. 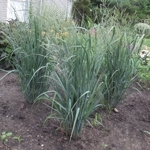 Here are two super versatile classes of ornamental grasses that will grow in both wet and dry soils. Switch grasses are taller grasses that stand about three to six feet tall and thrive in full sun, while most moisture-loving sedges stay under a foot in height and can take some shade. Choose which one best fits your situation and you’ll enjoy these low maintenance perennial grasses for years to come. One look at its dinner plate-sized flowers and you’ll assume this is a tropical plant. But rose mallow is actually a very cold hardy perennial, reliably surviving zone 4 winters (-30°F). The varieties we carry were selected for their extra-long bloom time since they produce flower buds all the way up their stems. Huge 7-9” flowers appear every year from mid to late summer into fall. Grow these large perennials in place of shrubs and they will thrive in your sunny, wet landscape. 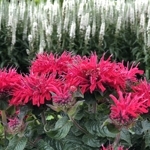 One of the best plants for attracting pollinating bees, butterflies and hummingbirds to your garden is bee balm. Thankfully, deer tend to leave its fragrant foliage alone. The varieties we carry were carefully screened for mildew resistance, so you won’t need to worry about spraying, and their shorter size means no staking is needed. Just pop them into your moist soil in a sunny to partly sunny spot and enjoy them all season in zones 4-8. Three reasons to grow sweetspire: sweetly scented summertime blooms, spectacular fall color and how well it thrives in moist soils. If you need a beautiful, low maintenance shrub to soak up all that extra moisture and deliver awesome flowers and foliage in return, plant a sweetspire. It never disappoints! Choose from small to medium-sized varieties, all hardy to zone 5. This is one of the coolest native shrubs you’ve never heard of, and if you garden in wet soil in zones 5-10, you’ll definitely want to check it out. Sugar Shack is a refined selection of the native species, forming a three to four-foot rounded clump of glossy green foliage. Quirky golf ball-shaped, fragrant flowers that attract pollinators appear all over the plant in midsummer followed by bright red fruits in fall. Be the only one on your block with this amazing plant! Don’t be put off by the terrible common name of this amazing native shrub! (Pop one of its extremely sour berries into your mouth and you’ll know instantly why it’s called chokeberry.) 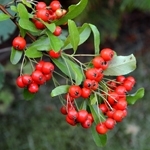 Though its fruits are ornamental, most people plant chokeberries for their extremely durable, low maintenance manner and brilliant red-orange fall color. 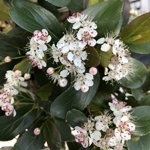 If you are looking for a low mounding groundcover or medium-sized hedge for zones 3-9, there’s a Low Scape chokeberry variety to fit your needs. 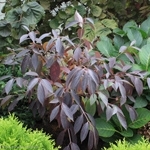 For moist to swampy soils in zones 4-8, it’s tough to beat our native silky dogwood. This pollinator-friendly, deer resistant shrub has four seasons of interest. From spring into summer, bees and butterflies will visit its pure white blossoms for a nutritious snack. Showy clusters of blue fruits follow the flowers as will the songbirds that devour them once they are ripe. In fall, the bright green foliage turns purple, then scarlet red, followed by glowing red stems to enjoy all winter. This amazing native shrub really does have it all! 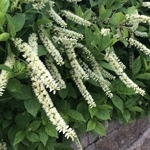 Last but most certainly not least is a native shrub that everyone needs in their landscape. Once you grow winterberry holly, you’ll never want to be without it! We don’t always think of how the garden looks in winter when we’re planning, but winter interest is exactly why you plant winterberry. Its fire engine red, orange or yellow fruits (depending on the variety) appear in fall and persist into winter. They’ll be the most brightly colored plants in your landscape and you will be so happy you planted them when you look out the window on a snowy day. Winterberries are hardy in zones 3-9 and prefer full sun or part shade and moist soil. 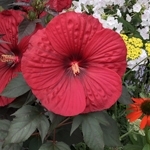 Want to find more plants for moist or wet soil? Use our advanced search tool to find just what you need.